A nameless writer wanders the streets. To have the strength to write, he must have bread. To have money to buy bread, he must write! As our hero wrestles with this conundrum, his last pennies are spent and his belly empties. But as hunger bites, his senses are heightened, his appetite for love and beauty grows and, even in the deepest hardship, he retains a thirst for life and all the good things that the wide world has to offer. 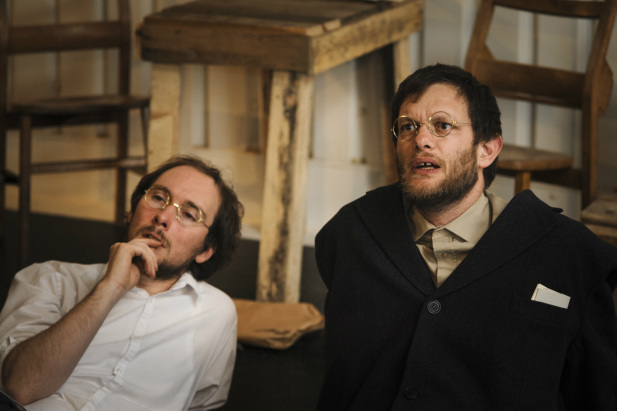 "Hobo chooses to perform in non-theatre spaces and here the company have struck gold – or the bread equivalent. ‘Hunger’ takes place in the pastry area of excellent London Fields-based artisan bakery E5. Jamie Harper’s staging is simple and clever and the restrictive space is used very well, with the action weaving between the audience’s benches. The lucid, modern adaptation of Hamsun’s often surreal text has moments﻿ of real poetry, evoking the tussle between a restless, creative mind and a body’s basic, confining needs." "Hunger, from the appropriately named Hobo Theatre, is the most charming combination of theatre and food you’re likely to experience for a long time. The play is extremely fast-paced, thanks in part to the accomplished multi-roling of Harriet Green and Andrei Ionescu. In multi-roling of a different kind, the protagonist is played by producer Hugo Thurston and director Jamie Harper, who also adapted the script. This turns out to be a wonderful idea. The two performers shift almost imperceptibly between protagonist and narrator, adding complexity to the central character, and acting as an incredibly clear visual metaphor for his moments of internal conflict and agitation." "Towards the end of the show the hunger becomes not just a feeling demonstrated on stage, but also a feeling in the stomachs of the audience. Just in time, the play comes to a rather lovely conclusion, and out comes a delicious Scandinavian meal of soup, beetroot, cheese and wonderful bread. I’d like to say that as I happily and contentedly walked out of the little bakery that hunger was the last thing on my mind – but full as I was, the subject matter of the play stayed on my mind for quite a long time." "The adaptation is really rather ingenious, condensing the book into 75 minutes or so. Hugo Thurston and Jamie Harper embody both narrator and character, thought and action in constant interplay in a compelling mixture of a fascinating man and his trials. Andrei Ionescu’s gently strummed guitar, playing music arranged by himself, adds another texture to the production which revels in Emma Robinson’s rustic, simple design. The mix of tables swiftly converts into the dining area at the show’s end where copious amounts of freshly baked bread, cheese, steaming bowls of soup and slabs of gorgeous cake are served to satisfy our own hunger, embracing the communal feel of both dinner and drama in a most satisfying manner."